If you’ve posted a link to some Spotify music on Twitter recently, you no doubt will have seen the once-only reply from @spotichart. 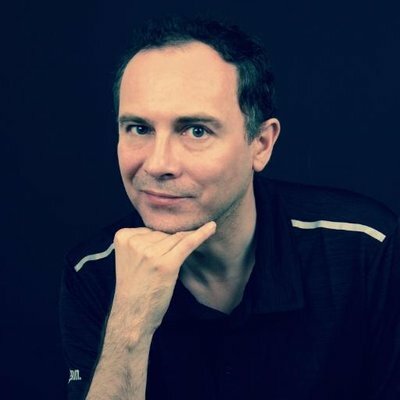 You might have thought this was some Spotified-spambot, but it is in fact a gateway to a cool new Spotify Charts tool from developer Benoit Xhenseval. 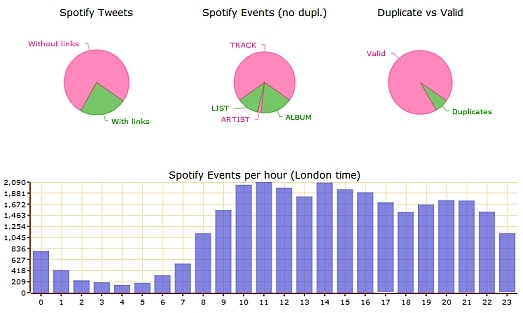 SpotiChart (formerly Spotify Global Chart) monitors Twitter for tweets with Spotify links, then analyzes all the links to compile all sorts of global charts and statistics. 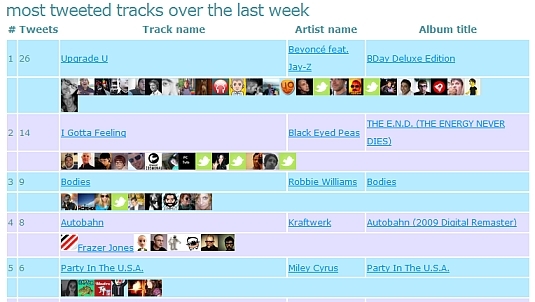 There are charts for individual songs (“Most tweeted Tracks”), albums, artists, and custom user playlists. For each type there are charts showing the totals over the last 24 hours, the last week, the last month, the last year, and since the charting began. Each chart includes links to play the music as well as little thumbnail versions of each tweeter’s avatar. The avatars are nice but do tend to slowdown page loading as there are so many of them (and avoid the sharing “pict” page as it needs to load over a thousand images). Another page lists the tweeters who have shared Spotify links the most, including their Twitter details such as location as number of followers. There’s also a general stats page with heaps of embedded Open Flash Charts mostly focusing on trends. For example, how many tweets contain Spotify links on each day of the week (Thursday seems to be the most popular day, probably thanks to the #thursplay hashtag). Various stats are auto-tweeted throughout the day from the @spotichart bot (the site tells you the schedule so that you can see you won’t be spammed to death). There are usually around 12 tweets a day. SpotiChart is a mine of real-time information that mashes Spotify with Twitter in a unique way. With its abundance of charts and stats, creator @benoitx‘s background in financial programming is evident. Until Spotify greatly improves its all-but-broken Top Lists feature (which haven’t been updated in months), Spotify Global Chart is your best bet to find out who’s been listening to what, and is much more relevant and accurate than other “hand built” charts out there. 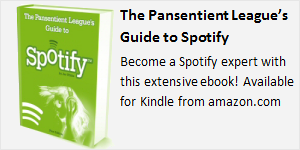 Pre-empting Spotify’s new Terms and Conditions, this app has been renamed to SpotiChart. There are also a couple of new features with the addition of tag and word clouds.